Diane Texas Sage is one of the most brilliant bicolor flowers we have ever grown. Sometimes it looks purple and sometimes deep pink, but it always looks beautiful. 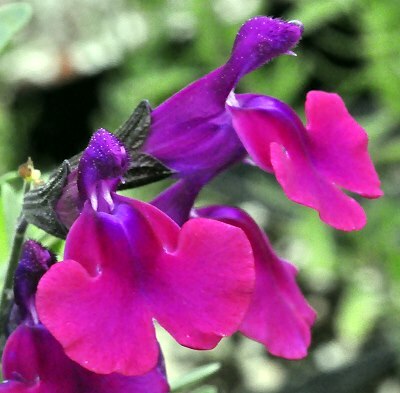 One of the advantages to the Salvia greggii group is that they are a manageable size. Cut back after spring bloom and it will rebloom in early fall. Cut back to a foot in fall to get rid of the dead flower stalks. Or don't cut it back at all and let it naturalize an area for you. Diane Texas Sage makes a great addition to our Edible Flower Herb Garden Six Pack. This plant is sometimes available in plug trays. These trays hold 128 of all the same plant. They are a great low cost way to fill a lot of space. Each cell is 3/4 of inch by an inch. Check here to see if Diane Texas Sage Plug Trays are available.